Next Post > 20% off Mighty Stitch Yarns! Happy October! I would say without a doubt that October is a favorite month among the staff at Knit Picks. The weather has a nice crispness to it before the dreary winter rain of the Pacific Northwest starts up again. Not to mention Halloween! But mainly it’s because it’s time to start on cooler weather projects like sweaters and scarfs. 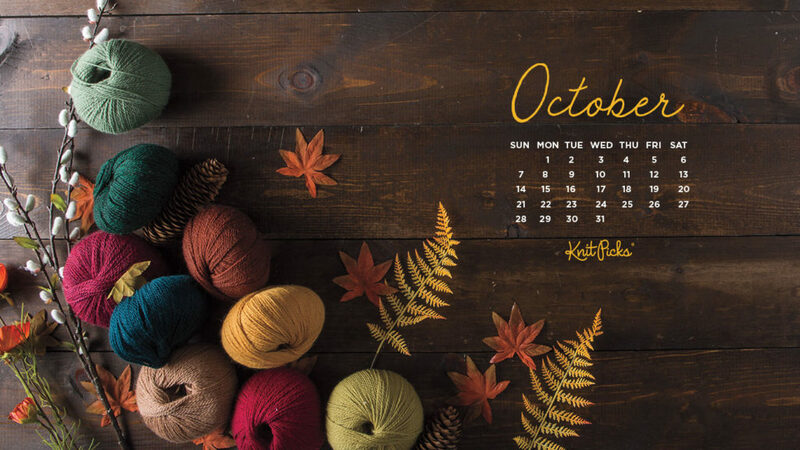 To inspire you all month long, we have some lovely colors of our beloved Palette and fall foliage on our monthly calendar. Maybe it’s time to start that long awaited colorwork project! To get the October 2018 calendar background of your choosing (smart phones, tablets or desktop computers), simply click the applicable device icon below. Enjoy! Super pretty! Is there anyway to get a high res version of the desktop background? It’s looking a little fuzzy on my desktop. Lovely colors and layout – thank you! The wallpaper doesn’t fit my entire screen. It always has before. Just for reference, May and July desktop wallpapers were 1366×768. The Oct. wallpaper is only 1024×576. That’s why it won’t fit my screen, which is 1366×768. That’s too bad since I love all your wallpaper. Hello all – we’ve updated the link, it was accidentally sized down by the wordpress platform. It should fit the screens now! I think this is my favorite this year! Lovely! Such a gorgeous picture. Thank you! It is just beautiful! Thank you for updating it so quickly. What colors of palette are in this image? Love them all together. Thank you so much for these free printable calendar. I just printed these calendars for my family.